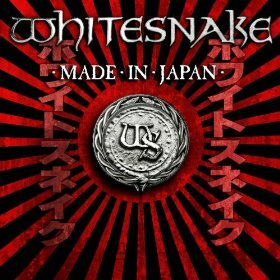 Recorded in Tokyo in 2011 at the Loud Park Festival, we get a blistering Whitesnake band. There’s Michael Devin on bass, Doug Aldrich and Reb Beach celebrating 10 years here with the snake-on guitar, blistering duo leads, Brian Tichy on drums and guest keyboardist Brian Ruedy behind vocalist/frontman David Coverdale on the 12 songs of the first of the two-disc set, Made In Japan. The opening thick chuck of “Best Years” starts the proceedings off great. “Love Ain’t No Stranger” sees the crowd singing back with Coverdale and “Is This Love” is dead-on perfect with the band rolling along behind Cloverdale (and providing very specific-and needed-backing vocals). Great slide opens “Steal Your Heart Away,” but I’m afraid this is one that showcases just what Coverdale’s voice wasn’t at the time. (The blonde rock god suffered a much publicized vocal injury in 2009 that he supposedly recovered from, but I’m sorry to say the injury, more than the recovery, is evident here.) Beach and Aldrich are great, but D.C.’s not up for this one, prompting the audience to sing a lot with him and provide some cringe-worthy moments in the slower bridge. “Forevermore,” from the band’s 2011 album of the same name, though is a great middle showcase piece. Coverdale actually has great vocals here (he even manages some great screams) and though acoustic and electric are featured from the great ax men, for me it’s the double bass work of Tichy, Michael Devin’s fat running bass and Ruedy’s heavy-handed synth strings that make this one a real showstopper. Disc two though is pretty cool. There’s a staccato-crazy “Love Will Set You Free,” on which the drums are kicking and Coverdale sounds just as good as ever, not that it’s a great song, but it’s fun with the falsetto. There’s signature slick slide work in “Steal Your Heart Away” a great swampy metal tune and then there are the acoustic versions of “Fare Thee Well,” a nice thick vocal blues/good chorus number and “One Of These Days” that sound really good. “Evil Ways” is about as crazy as things get here and again with Coverdale surprising with a great vocal performance. So the live stuff is a little rough in regard to Coverdale’s singing but this studio stuff sounds wonderful, Go figure?